Currently 7 different CPU solution are available from Intel's E3800 up to the i7 Quad Core. The boards come with ECC DDR3 RAM up to 16GB, some boards even with soldered RAM depending on the CPU modules. The processors are soldered onboard to withstand the most severe environments like shock, vibration as well as extreme heat. The boards are designed to make conductive cooling without heat pipe or fan possible. 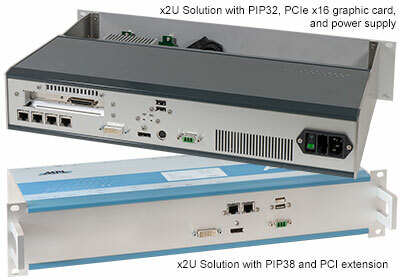 The base board has 4 LAN ports integrated and also includes interfaces like; up to 7x USB ports (3.0 and 2.0), up to 4 Serial lines (RS232/485), PS/2, external SATA port, two display ports (DVDI or DP), and as specialty an external PCIe port. Internally available are 2x SATA 3.0 and 2x SATA 2.0 as well as a LVDS graphic port. The standard input power range is 9-36 VDC, the power supply is an integrated part of the board. Other voltages (DC or AC) or redundant input can be integrated as well. The 19" rack solution is available fanless for an environmental temperature of -20°C to 60°C and optionally -40°C to 75/85°C. Long-term availability is key for all MPL designs. The products are designed to meet your needs today and tomorrow, and will be available at least for the next 10 years. As MPL buys and stocks all components needed for the manufacturing, they are also able to offer repair capability for 20+ years. The products have been designed and tested for most severe standards like IEC60945, MIL-810F, EN50155, etc..